My dock has an 18 foot well with a roof. The well is 20 foot wide. My soon to be toon will stick out about 4 feet. I'm concerned about sun and weather, but also fishermen casting onto the cover. 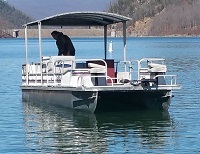 Anyone familiar with some type of retractible awning (or something) that can be lowered from the roof, back over the boat and to the water? Wind will obviously be an issue. Or, should I just throw a thick canvas over the back? If you can find a canvas shop nearby, possibly buy a remnant, and put a couple of eyes in it for tying it down or snaps. Wont be pretty, but should be functional. My cover does not extend and cover the rear deck/motor. My motor sits is slightly under the eve my boat house but with the angle of the sun and any type of blowing rain, it still gets wet and sun exposure. Also, even if you buy the Touchless cover, extend your current cover, get an engine cover, or do nothing, the fishermen are still going to snag it. I like the idea of the touchless, but doubt I would like the price tag. Also, they would not keep out the mud daubers we have here. I'm thinking the canvas may be the best benefit. Last edited by ksks on Thu Feb 14, 2019 10:27 pm, edited 1 time in total. I contacted a local cover maker and a billboard company. Both have used or surplus they are willing to sell or give away (billboard vinyl). I think I'll just put the cover on then cover it with one of those vinyls over that. Should have my new boat in 4-5 weeks! That will be about the time we can get back out on the water, on the warmer days. No pic. Don’t have the pontoon yet. The dock has 18 foot fingers and is 20 feet wide. I have a similar situation with our dock. The slip is 10' wide and only 24' long. So that back part of the boat and the motor, are extending out beyond the dock roof. I contact the Corps to see about extending our slip so the entire boat could be inside the slip and we can close the overhead garage door for that slip (right now, the door is kept in the raised position). I was told we can not change the footprint of our dock (basically, the frame), or we would lose our grandfather of our dock (new rules for distance between docks and distance to boat ramp -- both distances, we are currently less than the new rules). So what I was thinking about was welding some angle iron to make a frame to put more corrugated metal on to make an extended roof. The extension would have to pretty flat so it doesn't drop much lower than the current opening to the slip. From what I've been told, this sort of modification should not kill us being grandfathered currently. 1 suggestions that would work may be to contact a local awning company tha does alum frame and fabric 1/4 circle window and door covers. They are light and stand up to the weather, it can be mounted even with hinges on top or 4 or 5 quick disconnects to take of and on.